There are many types of caps out there - ceramic, electrolytic, and tantalum are some of the most common. Tantalum being the more expensive, they have better transient repsonse and lower ESR than eletrolytics or ceramics. This 10uF EIA-A is a small, simple cap that we use constantly with our small 150mA v-regs. Many v-regs require a minimum of 4.7uF on the output - this cap works great. Ceramics caps have no polarization. Electrolytics are polarized and have a negative marking. Tantalums are polarized but (just to screw with your head) have a positive marking. This one has a dark brown bar and a notched corner. This end of the cap needs to be connected to Vcc (or whatever). This is a 16V cap which means it can be exposed to about 10V safely (I de-rate all caps by about 50%). Above that and you can run the risk of burning the cap and in extreme over-voltages, blowing the cap. Yes, I've seen a hefty 100uF blow it's top completely and hit a person in the head when it was exposed to ~15V (it was a 6V rated cap). Here is an example basic power supply circuit using the TPS V-Regs regulator and a couple 10uF caps. 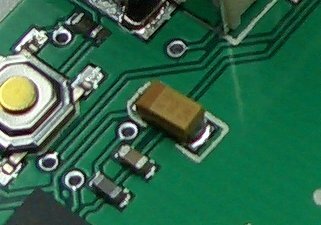 The TPS V-Regs can take up to 7V input so this 16V rated input capacitor will be fine. The input cap (C1) cleans up any big transients on the incoming side. The output cap (C2) helps stabilize the v-reg, decouple big transients, and cleanup any output noise. The addtional decoupling cap (C3) of 0.1uF helps get rid of any higher freq noise on the power line. With this setup, you'll see a really nice, low-noise output. This page was last modified on 5 February 2006, at 20:30.